When two breweries love each other very much, they come together and make collaboration beers. In that sense, Deschutes seems to be a bit promiscuous, running around town, making brews with some of the more prominent breweries. Its current collaboration is the Collage Conflux Series No 1 -- Collage for short -- which they worked on with Hair of the Dog. The result comes at a price, clocking in at around $12 for a 12 ounce bottle, but it is also very, very good. And that's even well before the recommended aging time. 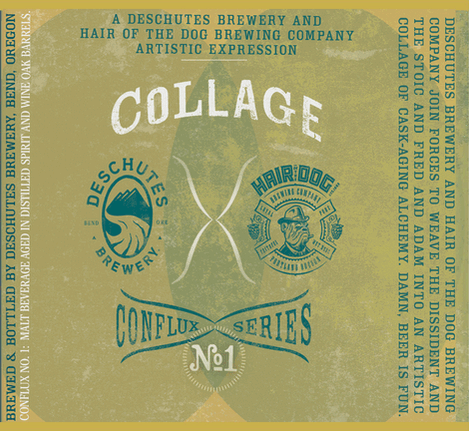 Just to give you some idea of the complexity that went into the Collage: This is a mix of Deschutes's Dissident and Stoic, and Hair of the Dog's Fred and Adam. (Hence the collage reference in the name.) The barrel aging list is the length of an essay, and includes whiskey-, cognac-, and pinot noir-barrels. So how does it taste? Sour, complex, and pretty damn good. It has a brown color with red hues, unlike anything I've seen before, with a slightly tan head. Sniff, and the cognac and wine barrels are evident straight up front, with citric notes toward the end. Tasting it is a project in itself. You can probably spot your favorites in there, though, to me, the Dissident came to mind first. That's not so much because of the sourness -- the Collage is sour, but not as crazily as I had expected -- but more the cherry flavors. There is also a surprising malt kick here which I assume could come from one or both of the Hair of the Dogs. This is all laced in a vanilla like sweetness, possibly from the bourbon or cognac barrels. This is a sipper, at 11.6% ABV, so take your time and enjoy it. Vote for Collage Conflux Series No 1: It’s your civic duty!